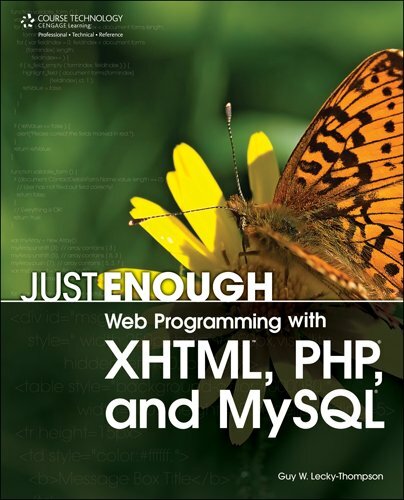 Welcome to Just Enough Web Programming, part of the Just Enough series of books, where the author’s aim is to equip the readers with accurate information that is immediately useful, rather than trying to make them an expert overnight. You should be able to get started very quickly, by taking the basic outline principles and shading in the detail as they progress. A newcomer to the World Wide Web and online publishing can start at the very beginning, and work right through to the end, whereas those who already have some experience can pick up additional tips and tricks at the appropriate point. The book begins with the ‘‘Getting Started’’ chapter, where you learn about tools that you can use to deploy Web applications and services. This chapter also points out some useful paths through the rest of the book for those needing specific guidance—for college courses, work-related problem solving, and so on. "Guy W. Lecky-Thompson" holds a BSc. in Computer Studies from the University of Derby, UK, and has written articles and books on a variety of subjects, from software engineering to video game design and programming.